A group calling itself Ghana First, has served notice it will demonstrate on Wednesday, March 28, against the approval of the Ghana-US defence cooperation agreement by Parliament. The group said the agreement is not in the best interest of the country, and must not be implemented. Parliament last Friday ratified the agreement, which allows the US military to camp some of its military forces in the country. The pact, which was approved without the minority in Parliament who were vehemently opposed to it, will also grant the US access to some of Ghana’s national security installations. Speaking to Citi News, Convener of Ghana First, Edem Agbana, said it is aimed at putting pressure on government to withdraw the agreement. “We believe that when we march unto the street, and demonstrate our anger, displeasure and disagreement with this particular deal that the government of Ghana has entered into with the US on behalf of the good people of Ghana, it will give the government an understanding that the people on whose behalf they have ratified this agreement are not in favour of it, and that they ought to withdraw it and get back to the negotiation table. Issues of national security are too sensitive issues to be left to politicians alone. We want the people to have an understanding of what it is that their government that they elected on 7th December 2016 have entered into on their behalf,” he added. The approval was done by only Majority Members of Parliament because the Minority staged a walkout during the debate on the Floor of the House. Ghana’s Cabinet had agreed to provide the US’ military troop a place near the Kotoka International Airport, and also give them unhindered access to some key installations following a Memorandum of Understanding between the government of Ghana and the US government. The MoU was laid before Parliament on Tuesday recommending to Parliament to ratify the agreement, but it was rejected by the opposition. Although many Ghanaians have expressed resentment over the clauses of the agreement, the Defence Minister, Dominic Nitiwul, said the agreement is in the best interest of Ghana. “The current Status of Forces Agreement (SOFA) between the United States of America and the Republic of Ghana is approximately 20 years old. It does not cover the current range and volume of bilateral exercises and assistance. This year, the United States of America is investing over $20 million in training and equipment for the Ghanaian armed forces. Ghana is also once again preparing to train U.S forces – as it did in 2017. The United States and Ghana are planning joint security exercises in 2018, which require access to Ghanaian bases by US participants and those from other nationals when included,” a statement from the US Embassy said. 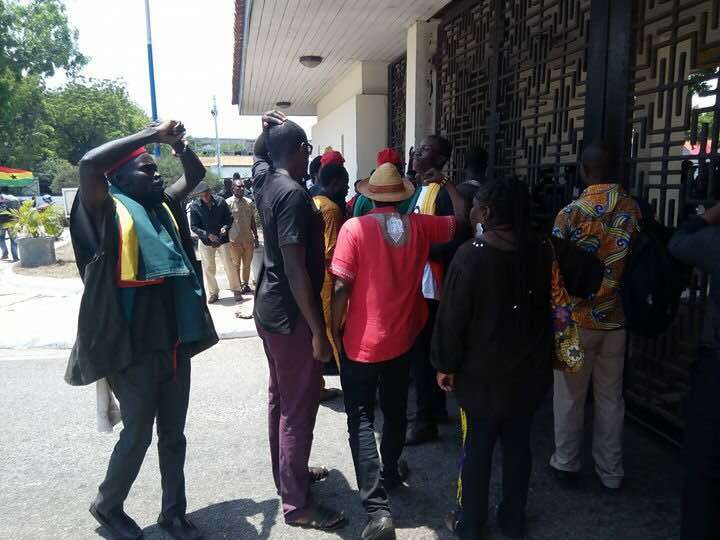 Before the approval on Friday, a number of protesters who tried to gain access to Parliament to kick against the anticipated approval were prevented from entering the House. The main entrance of the House was shut with strict access checks conducted for members of the public and workers who sought to enter. The protesters however chanted slogans and songs outside the House. The NDC at a news conference on Thursday, said Ghana could become a target for extremists if the agreement was allowed to go through. The General Secretary of the party, Asiedu Nketia, who said this indicated that a ratification of the agreement will send wrong signals which could subsequently make Ghana vulnerable to attacks. The NDC has already served notice that if the deal is approved, they will suspend and review it when they return to office in 2021.